Comox Glacier has taunted since before I knew its name. Driving up Island past Comox and Courtenay it looms on the western horizon. When Phil approached me about doing a two day trip up to the glacier I jumped at the chance! This past season had incredibly low snow pack and it was a great opportunity to take advantage of the early season. 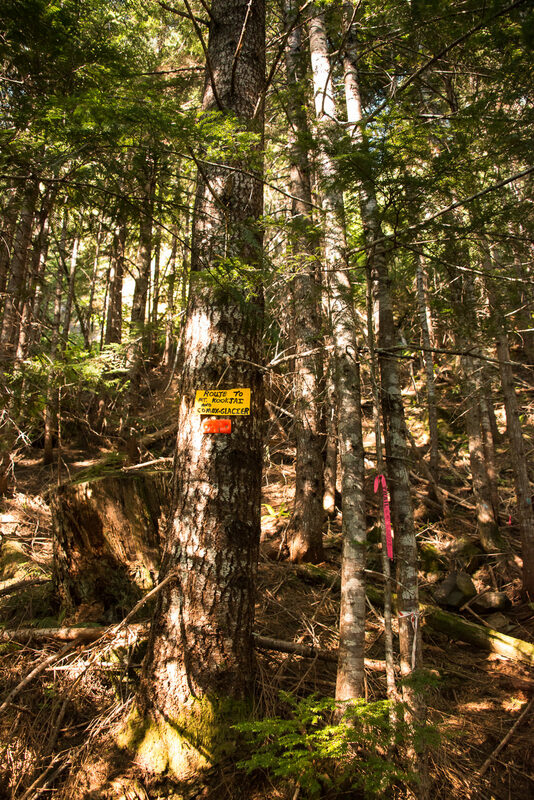 The fastest route to Comox Glacier is via the Comox Lake Main logging road, for the past few years Timber West has had the gate closed up tight! 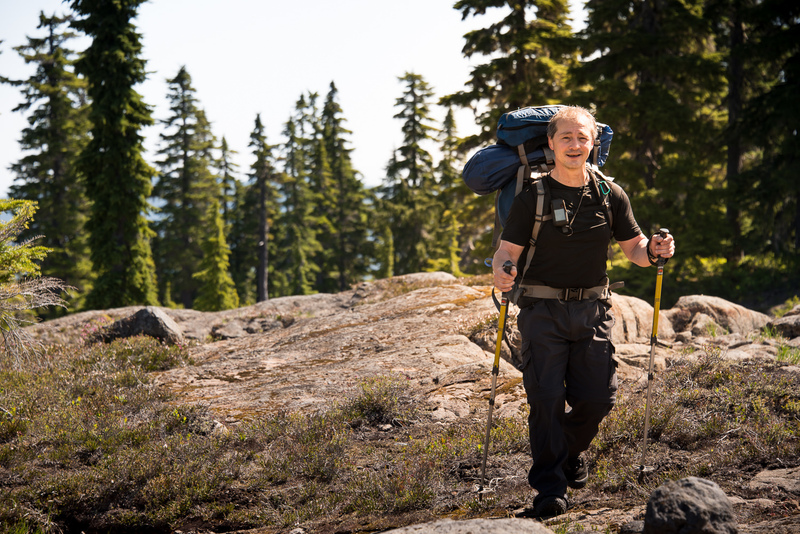 Only a few have access, like Comox District Mountaineering Club (CDMC) they pay annually for a key that gives them restricted access to the region. Recently, Timber West announced they were opening the gate for summer recreation! Once we learned of the opening we made haste, lest the timber company lock the gates again for a fire ban. 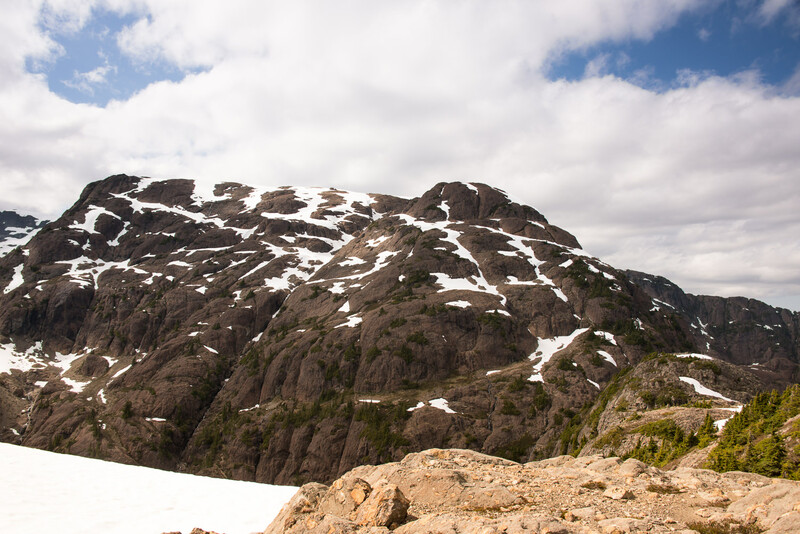 Phil suggested hiking the first-ascent route, going up over Kookjai Mountain, past Tatsno Lake, then Black Cat Mountain before making the final ascent through Lone Tree Pass to the Glacier. We used a variety of sources for beta, one indicated an epic day-trip was possible! Apparently taking the hiker only 12 hours to summit and return to the vehicle. We were not so ambitious, we planned an overnighter. 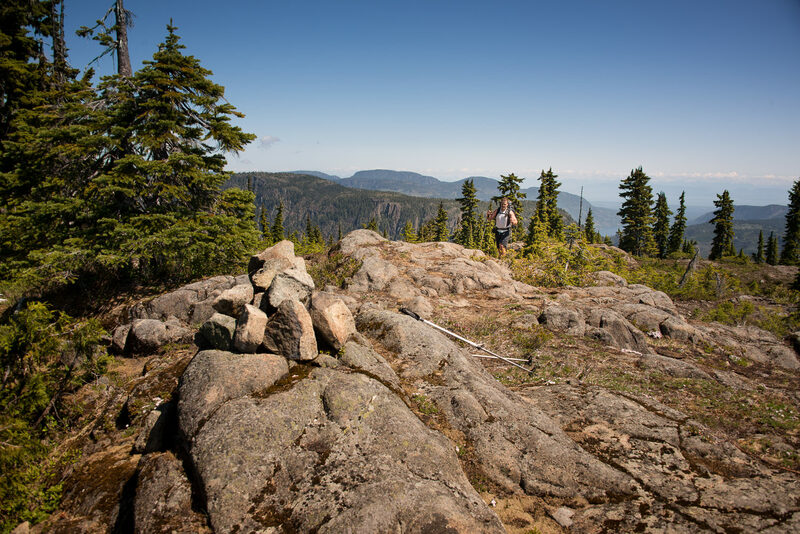 Our route started at the Comox Gap, would take us up over Kookjai and down the ridge to Tatsno Lakes where we would set up our camp and rest before heading up over the unnamed ridge and eventually onto Black Cat Mountain and beyond, before returning to Tatsno Lake! We set out at 6 am from Phil’s house. The three of us loaded into Rick’s Ford Focus and I set my eyes to snooze. I dozed through most of the drive but woke as we turned at exit 117 into Cumberland. Once in Cumberland turn right on Bevan Road and follow this, about 5.5 km down the gravel road you will need to turn left, this will get you to the Comox Lake Main. From the mainline there are several spurs where you could turn wrong. You can refer to my GPS route for more exact information but basically we followed the Comox mainline to Cruikshank main, followed that north and turned left onto the South Fork Main until we came to an impassable crossditch. At this point we we were close to Cougar lake and less than a kilometer from Kookjai Route, our starting point for our ascent to Comox Glacier. Even upon exiting the car we new the day was going to be hot. though it was very chilly in the shade as we start at 8 am, the distant hills were bathed in light and the dry scent of the mountains drifted to us…. It was going to be a scorcher. We had a route to follow, and we made our way to the start of the trail quickly. A ribbon marked the start of our route, leading us onto a long abandoned and now lightly overgrown old logging logging road. We followed along a lightly booted but ribbon path to the end of the road (600 m), where we found a plastic signed, marking the Kookjai Route to the Comox Glacier. The route to Kookjai Mountain is about 7 km, sees about 1000 m of elevation gain and tooks us 3.5 hours to hikes. It’s easy enough to follow, if you have keen skills of observation, there are lots of flags and the route is mostly well booted. 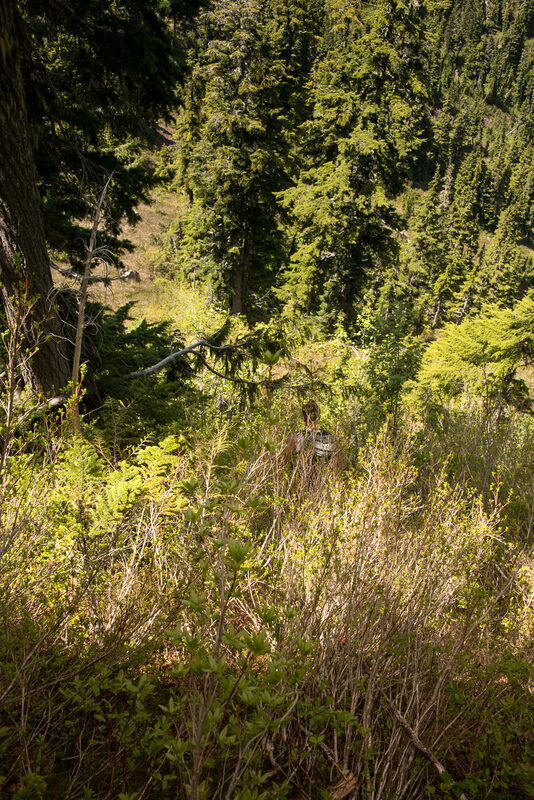 The toughest section of the hike is near the beginning through a regrowing clear cut. Once at the clear cut the hiker only needs to look up to the skyline and pick the large notch at the top. Following the hill down it is possible to spot several markers indicating a marked path through this tough steepish section. Once through the clear-cut, the flagged/booted route resumes and leads along the ridge as it climbs toward the summit. There are only a few steep sections to navigate and the flags are mostly well placed. Many of the flags were placed in 2003, it’s clear that a few trees have blown down and they are the only obstacles on the route. 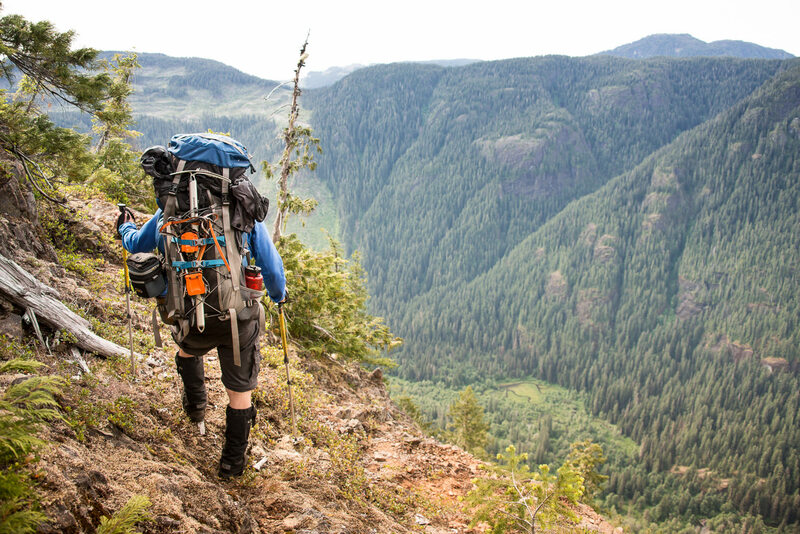 Our climb was slowed by the heat of the day and the weight of our overnight packs. As we hiked the sun blazed down, increasing the temperature and humidity of the forest. We quickly drank through our reserves of water to keep cool in the heat. We made the summit at Kookjai 1279 m around 11:30 am. The established route from Kookjai to the glacier is difficult to find, I think it requires backtracking; We found it on our return to the car the next day. Making our way from the summit to Tatsno Lakes, we didn’t follow a marked route. This cost us some time and energy. We lost more elevation than needed, we regained the lost elevation and followed the top of the ridge west to the end of the ridge. Here, we picked up a flagged route that lead us through a slightly bushy (B2) and steep descent from the ridge to the largest of the Tatsno Lakes. 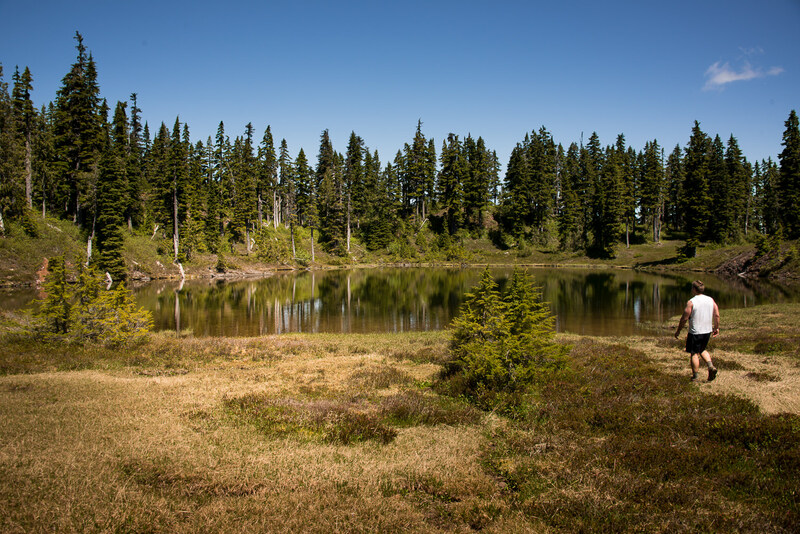 The lakes are about 7.5 km from the trail head at 1080 m, they are a beautiful, they are surrounded by meadow grasses, which can provide suitable campsites in drier months. On this trip the grasses were just awakening from the short winter, they were mostly still brown. We easily picked our way through through the soggy ground to a smaller lake, closer to the next ridge we needed to ascend. We chose to camp in the grass, to be close to the lake but I would recommend a higher level, it would be much drier and likely a better camp spot. We arrived at the lakes around 12:30 pm and set up our tents and took a break. Rick even took a short nap. I think he may have been suffer from minor heat exhaustion. By 1:30 we continued on our way. From our campsite we examined the unnamed ridge to the west. I picked a route up the most gradual incline, eventually we picked up the route again, though very lightly booted. In reality, the route continueing from the campsite was sparsely marked, only enough to remind you that you were basically heading in the right way. The unnamed bump tops out around 1440 metres. At the end of it we encountered the toughest section of the hike. To get to the ridge that approaches Black Cat Mountain it’s necessary to descend 1240 meters before immediately ascending the next ridge. The descent is bushy, probably a B3 from Island Alpine. The foliage provides excellent and necessary hand holds as we moved down the very steep hill. Coming up the final ridge to Black Cat we were all beat, we knew that we wouldn’t make the glacier today but we persisted and achieve Black Cat. As we passed 1400 metres we encountered the first hints of snow we had to walk on. On the final hill leading to the summit, we interrupted a mother black bear and her young cub! The cute little buggers high tailed it before I could get a photo but Phil caught a great one! We summited Black Cat 1605 metres at 4:30. 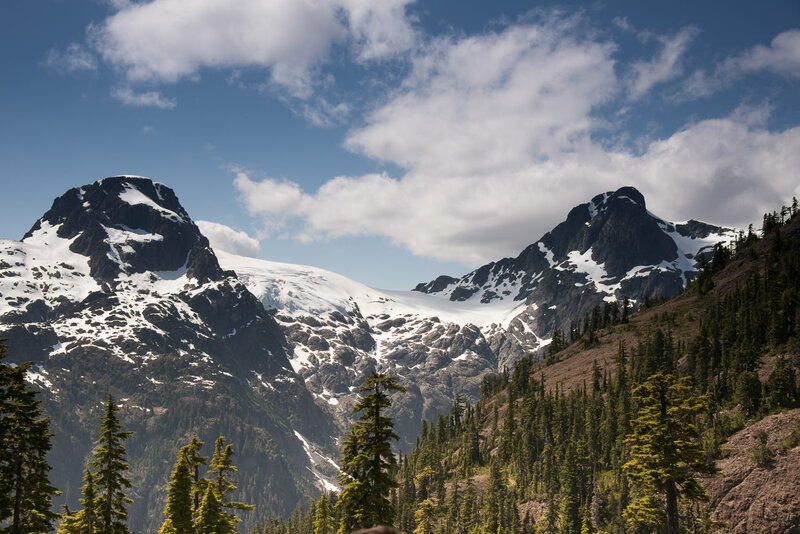 The hike to Black Cat Mountain, from the trailhead is over 1800 meters and more than 13 km the trailhead We sat for a long while, refueling and staring at Comox Glacier. We sat less than 1.5 km from the highpoint. We were so close! We wouldn’t tempt fate, heavy clouds were rolling in from the west, looming heavy over the glacier and the route up the glacier still had a lot of snow. We could make out footprints heading up the route but we were not ready to follow, we turned back to camp. We were concerned about making it back to Tatsno Lakes before dark and we were fearful of the rain. The return hike was quicker, it had a strong downward trend back to camp. The only challenging section on the return was the ascent up to the unnamed ridge. The greenery that provided such wonderful handholds on the way down thwarted our ascent! As is the case in regions that receive several feet of snow each season, the braches all pointed downhill. When travelling up they got in our way and made progress annoying but not impassable. We arrived back at our camp well before dark at 7 pm. All told we hiked 25 km and 2000 metres. We were quick enough considering the elevation gain, the heat and the required route finding we needed at times. Regardless, we were tired and hungry! The insects were there to great us, relentless. I put on my mosquito armor and set about the making food and prepping water for the next day. It was still an hour before sunset and two hours before dark, when the first of us hit the hay. As usual, I was slow in my tasks, the last to prep water, the last to eat and eventually the last to bed. I took advantage of the solitude. The small lake and the meadow where tranquil. Two wood ducks were making their night on the lake and they played a game of steeple chase, or perhaps…. duck, duck, goose. I sat and watched as they chased each other around the pond flying and landing, over and over again. As I watched steam wafted off the lake and lazily drifted over the surface while the drone of the mosquitos grew loud, drowning out the soft sounds of the sleeping campers. Before long the frog serenade began, their songs penetrated the hum with their staccato tune. I Took this video. There was still light when I climbed into my bivy and went to sleep. The temperature dropped quite low in the night. Waking in the morning there was a light frost on the tents and the ground. We were up before 6, the light of the morning burning on the hills surrounding the lake, I couldn’t sleep in. We had pleasant chit chat and packed our bags before heading back. Our return route was much faster. We found it easier to pick up the flagged and booted route from Tatsno Lakes. We made it home quickly. The early morning departure permitted us quick travel in the coolest part of the morning. We arrived back at the car before noon and headed for home. Comox Glacier will have to continue to taunt me as I drive by it, It’s still on my list but next time I will hike the more exposed but established Frog Ponds Route. 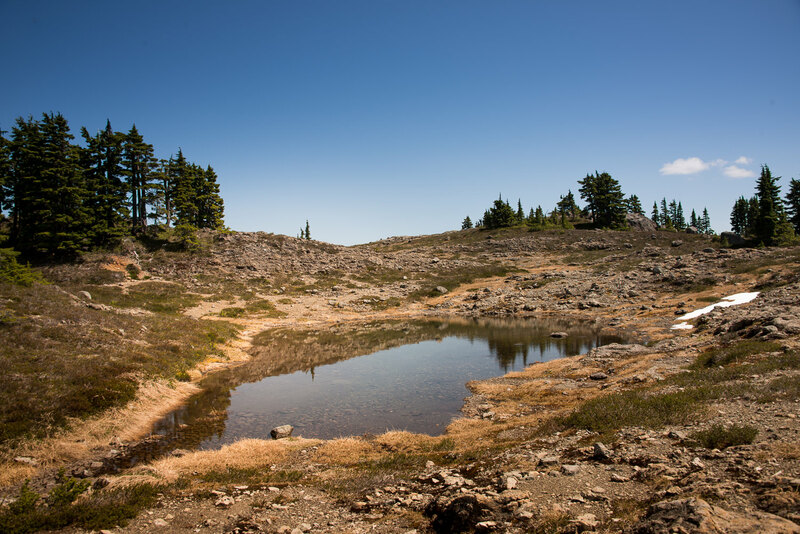 Have you hiked the Kookjai Route or Frog Ponds Route? I’d love to here your perspective for a successful summit attempt. See Full album of all my photographs…. Hi Matt : Yes, many years ago, I did this route twice. It is more of a 3 day trip than two. That was my sign at the old logging road, going up towards Mt. Kookjai. Did you sign in at the summit of Mt. Kookjai ? We did sign in at the summit of Kookjai. We noticed that you signed the register a few times. This summit only sees about 2 groups a year. The route to the summit could use a bit of work, mostly through the clear cut and the section right before it. Otherwise, there is only one tree that is obscuring the route. Hey, any chance you have the GPS track for this route still? The one on the garmin site no longer works. I tested the site. It loads but the route doesn’t display, you have to refresh the page and it appears. If you send me an email I will send you a .GPX, otherwise you should be able to download it from Garmin Basecamp. Let me know if it works out for you. Just got back from doing this route – but as a loop starting from the Frog Ponds. 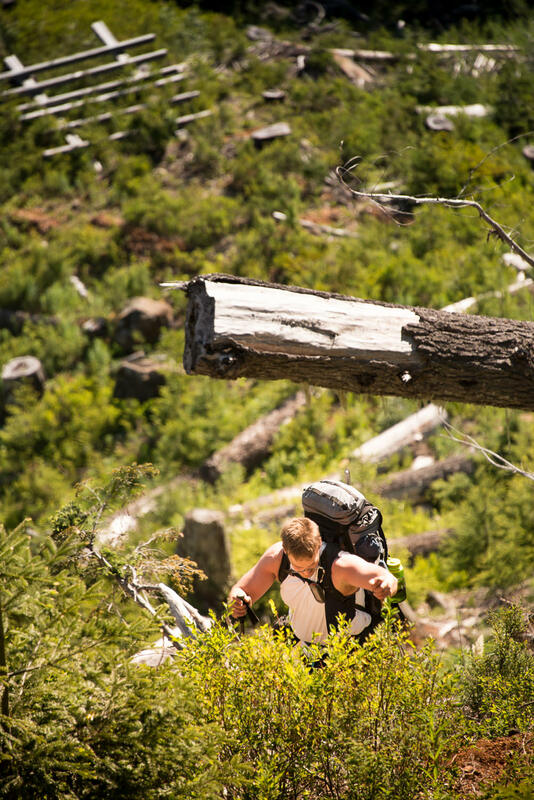 The trail is not well marked in parts, especially between Kookjia to Black Cat Mountain. I think we got stuck in the same spot as you, in the dip before the ascent to Black Cat. There’s only one way up the east side which is hard to spot. most flags are blown down on the ground. We also got lost following the wrong flags down to the Kookjai start point. We ended up on top of Cougar Lake and had a bad bushwhack down to the logging road. btw the gps track appears on the Garmin site – just the link to download doesn’t work. Sorry to hear about the technology issues. This is a problem on Garmin’s side. In the future, I will send you the GPS track directly. Normally you click on download and it opens Basecamp. They have a weird sandbox that you have to use to get the data. Of course, I use to store my tracks and organize my data, so I suffer through it.